Emmanuel (Manny) Jimenez is the Executive Director of 3ie. Manny was earlier the director of public sector evaluations at the Independent Evaluation Group of the World Bank. 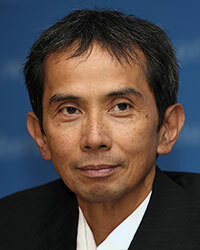 Prior to this position, he was responsible for the bank’s operational programme in human development in Asia. Before that, he served in its research department. He has published numerous monographs and scholarly articles in the fields of education, social protection, labour, health, urban development, public finance, environment and population. He also led the core team that prepared World Development Report 2007: Development and the Next Generation and is editor of the journal, The World Bank Research Observer.